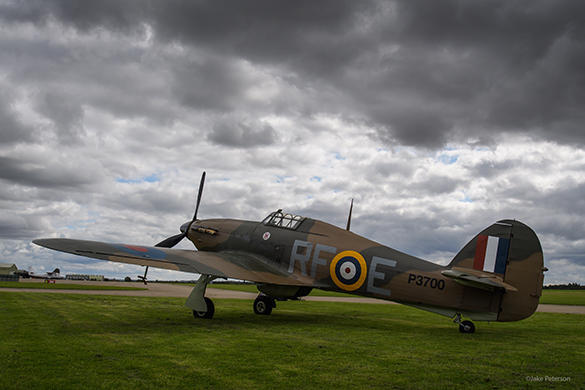 You can’t beat photographing a Hurricane and a Spitfire in Britain! One of the best parts about my latest trip to England was having the chance to photograph both of these amazing aircraft at Duxford. Thanks to the nice folks at the Historic Aircraft Collection nine participants at Dad’s UK Aviation Workshop got a chance to see these rare pieces of history up close. While I was helping with instruction, I got a chance to work with them too. The Hurricane is the unsung hero of the RAF. During the Battle of Britain more Hurricanes were used then any other plane and throughout the war in Europe Hurricanes were used in every front. The Hurricane came out in 1937 and was Britain’s frontline fighter for a long time before the Spitfire came out. While not as fast or agile as the Spitfire, the Hurricane was far more rugged with greater armor. The Hurricane was known for getting their pilots back to the airfield. In many ways the Hurricane and Spitfire are like the P-40 Warhawk and P-51 Mustang. It was a treat to see the Hurricane but to have a chance to have both in one frame was truly unbelievable. When it comes to working with multiple aircraft it helps if you have the ability to position them to a more flattering angle. If you don’t then it’s best to choose subjects that naturally look good together. After that watching the background and getting low to help show more sky helps with the overall image. 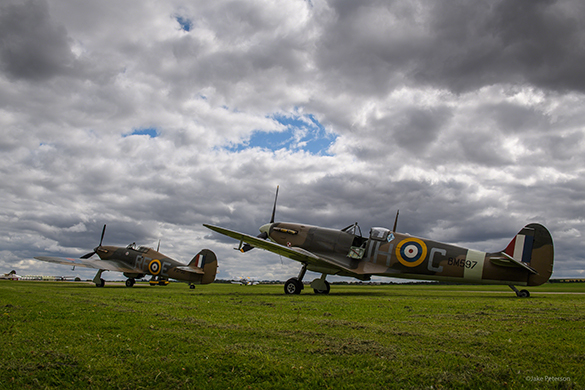 Throughout the Battle of Britain the skies were dark and cloudy, including that is not only natural for England but also to recreate that bit of history.